Using NodeMCU remote control is a piece of cake. Most NodeMCU remote control source code that you find on the Internet uses the ESP-12E as a Web Server. Shipping HTML around is pretty complicated. The software implemented here uses a simpler TCP/IP client server approach. You just define some commands and responses in plain ASCII. The software interprets the plain text as either a command to do something, or a request to provide some information. Connecting with the ESP-12E can be done simply with any socket client, such as SocketTest. All you need is the IP address and port number for your NodeMCU. This source code runs the device as a Station on your wireless LAN. You can modify it to run with a Static IP address, or even as an Access Point separate from your LAN. If you want to use your Android phone to control the ESP-12E remotely, there are various TCP socket apps you can download. This example of NodeMCU remote control operates two servos and a relay. You could easily modify this to run things like stepper motors, or read data from sensors, while maintaining the same overall architecture. Enjoy! Here is the source code for simple hardware remote control. This can be used as a template or prototype to control many types of hardware, or read data from sensors. Hope this will help you implement your “Making It Up” dreams and ideas. 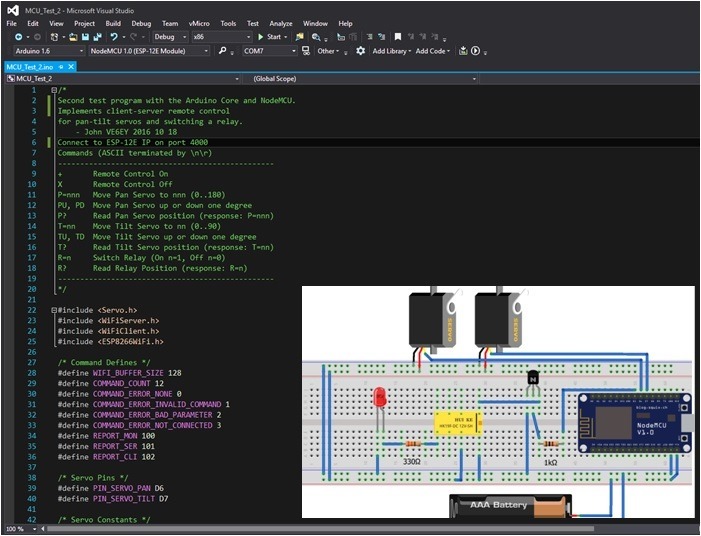 This project was implemented using Visual Studio Community Edition, Visual Micro (the Arduino IDE plugin for Visual Studio) and ESP8266 Arduino Core. Second test program with the Arduino Core and NodeMCU. for pan-tilt servos and switching a relay. /* At this point we are ready for a new remote connection. // ignore error if first character is "-"
Hi I would like to know more about the hardware setup you have used. I can’t quitre see what components you are using in your screenshot. Does the NodeMCU run on 3 volt logic? Do you have to what are you using to boost the voltage / current for the relay / steppers? I just don’t see a link. Am I missing something simple? At the end of the article is a black horizontal bar with a magnifying glass. When you hover your mouse over this bar, you will see “Show Source”. Just press down and the code will be displayed.